The Solar Impulse airplane, brain-child airplane of Bertrand Piccard and André Borschberg (who co-piloted the entire journey) that can fly day and night without fuel or polluting emissions, has ended its cross-country journey in New York City. Solar Impulse is an unique adventure that seeks to put some emotion into solar power and also a flying laboratory to find innovative technological solutions for today’s solar challenges. The carbon fiber airplane is the result of seven years of work, calculations, simulations and tests by a team of about 80 people and 100 partners and advisors. It has the wingspan of a Boeing 747 (208 feet) but only the weight of a car (3,527 lbs.). The largest:lightest plane ever built. 12,000 solar cells built into the wing provide four 10 HP electric motors - that's the power of a scooter - with renewable energy. By day the solar cells recharge the 400kg / 881 lbs. lithium batteries which allow the plane to fly at night. 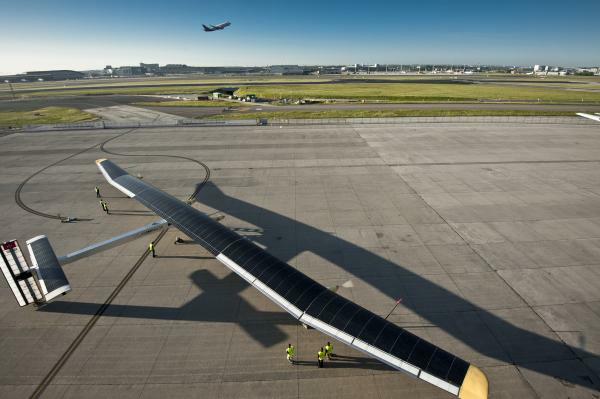 New York City is the final destination for Solar Impulse’s 2013 Across America journey, which began on May 3 near San Francisco with stops along the way in Phoenix, Dallas, St. Louis and Washington D.C. The plane will stay at New York’s John F. Kennedy International Airport until Monday, July 15 before going back to Switzerland.